Interests - Playing with cars and planes. He enjoys all craft work, helping in the garden and he loves socialising, he is the life and soul of any gathering!! He loves any book, especially sat with someone looking through it. He likes Superman,, Disney films, Mickey Mouse, Mr Men, dinosaurs, Winnie the Pooh and giraffes. Reuben was born in December 2002 just before Christmas, so he was the most wonderful gift we could ever have wished for! As Reuben developed during his first year, family and close friends would occasionally comment that his head tilted to the one side, we just put it down to him being tiny and with all the developing from sitting to crawling to walking it would be something he would stop doing. Reuben went to stay the night with his Nanny and Dan Dan in May 2004, he was 17 months old. When we went to collect him, I thought he looked a bit wonky and was walking quite ‘dandily’. Anyway that night when I bathed him I noticed a curve in his spine. I think the time away from me, had enabled me to see that something wasn’t quite right with his stature. Anyway Reub went to see lots of Drs and was referred to the Orthopaedic Hospital in Birmingham. We were told that he had very severe scoliosis. This was very difficult to accept as he appeared and still does to be a typical active toddler. Reuben had lots of tests and we were told that he had 4 fused ribs and an ‘s’ shape spine. The capacity of his one lung was also being affected as the spine was compressing it. Reuben’s only hope for a relatively normal life was pioneering surgery which had been developed in America and Reuben’s specialists had just got the licence to perform it here. In January of this year, Reuben had his first titanium rib implant. It reaches from his neck over his rib cage and attaches low down on his spine. This will be lengthened 2 -3 times a year and will be replaced by bigger models about three times. As Reuben is such an active little boy, they think the implants may break so will need replacing also should this occur. This surgery will have to continue until Reuben stops growing, around 18 yrs of age. Early next year, he has to have a second device which runs under his armpit to the bottom of his rib cage and also two spinal rods each side of his spine. It is hoped that they will lengthen all 4 rods at the same time to reduce the operation numbers. We are very fortunate however that Reuben is a very strong and spirited little boy and he will not let anything drag him down. He is just 2 yrs of age and after having such major surgery he was at home playing with his toys just 4 days after the operation. He is truly a wonderful and brave little chappy. Sorry it has been so long, things here have been so very manic. We went to Disney in November which Reuben and Louis really enjoyed. It was a lovely break and the weather stayed dry but boy oh boy it was cold. Reuben had an appointment in Birmingham last Saturday and we were told he needs urgent surgery to replace some metal work and also to expand on the opposite side. We were not thinking he would outgrow the Titanium rib so quickly but it appears he has had a huge growth spurt. So, the little guy goes in on Tuesday for surgery. This time he is going into the Orthopaedic Hospital. We are hoping it won’t be quite so manic and busy. This time Jonathan has to take him without me as we have baby number 3 due in 2 weeks and it is all a bit much. Apart from this, Reuben is great and doing so well at school. He’s still a real inspiration to us all when we moan about silly day to day stuff and I try to put things into perspective! Reuben is doing very well all things considered. He is back at school and doing very well too. We’ve just had parents evening and despite his time off school he is doing so well and his teacher is full of praise for him – phew. As the weather has started to get colder, we have noticed Reuben becoming increasingly stiffer and putting his shoes on and basic things like that are appearing more difficult. However, he never complains, he just grits his teeth and gets on with it all. He is getting some pain in his hip too which can keep him awake at night. We are awaiting a response from his Surgeon on these matters. Last Christmas was not a great time for us after Reuben had his surgery. So we have decided to make this one extra special for him and for us as a family. We are going to Euro Disney for 4 days at the beginning of December. Reuben is so excited, Louis too. So, fingers crossed that the weather stays dry for us. A huge thank you to all the people who continue to send post to Reuben and to Louis as well. Reuben received a lovely book yesterday. Thank you very, very much. It has some wonderful ideas to keep the boys amused over the wet sunny days! The money that enabled Post Pals to send this book was raised by Pal Jon Paul O.
Reuben went into Birmingham on the 23rd of July for his long overdue surgery. It was hard going, but we are so relieved it is now done. Reuben had two incisions in his back. Each one was to lengthen the metal work he had put in last December. He is doing very well now and seems not to have suffered the same trauma as he has previously. He has been back to hospital since with severe head pains and vomiting. We were advised to take him as it could have been linked to the surgery but thankfully it was just a nasty old bug! Looking at Reuben now, 12 days on, it is hard to imagine that he has had surgery when he is lifting his 2 year old brother and running around. We go back to Birmingham next Monday to find out when the next lot of surgery is going to be and what they intend to do. At the end of August we are going to Scotland for a week by the sea, we are all looking forward to it very much! We’d like to say a continued thank you to all the people who send post to Reuben and to Louis. Reuben was due to go into hospital today to have his two implants adjusted. We had a phone call last minute to say the operation has been cancelled AGAIN! This time it was due to them being unable to get the parts required for Reuben’s back. It just adds to the anxiety again, but we should be used to the cancellations by now. The operation is now due to go ahead on the 23rd of July. Apart from this, Reuben is very active and well. He tires easily and by evening he is a little grumpy but it is hardly surprising as he is such a busy little bee! Reuben has had so much post in the past month so thanks to all of you who have been so kind. It is wonderful what you do, it certainly makes Reuben smile (and Louis too). I have a pile of letters and cards which I have been meaning to reply to and the pile is growing daily, so please forgive me if I don’t reply, I just don’t have the chance at the moment. All of the post is so greatly appreciated, but a special thanks to the following people: Kate Dee for the wonderful cards and gifts. Reuben loved growing the dino egg and is now growing a sea horse. Thanks also for the Power Rangers. A lady from Largs in Scotland sent Reuben and Louis a book, pencils and rubber set, thank you. Ellyn Yeager from Alabama. thank you for the post. Thanks to Jade Boyd who sent two lovely books. Emma from Wrexham wrote to Louis and sent a lovely card with surprise glitter and sprinkles, thank you. Emma, his favourite animal is a Giraffe, his TV favourite is Mickey Mouse and Postman Pat and I think he likes the colour blue. Final big thanks to Adam and his mum from Ashford in Kent. Thanks for the lovely letter and beautiful pictures, I will reply soon. Reuben was due to have the metal rod and titanium rib extended at the end of April. This was to be done before we go on a family holiday in May. When chasing the date, I was told the list was full. So there will no operation at the end of April. It is so frustrating as we are going on holiday and try to organise things to keep the family as normal as possible. I’m not sure what we will do now; I’m awaiting news from the hospital. Apart from this Reuben is on great form and is really well and back at school. After Reuben’s operation on the 12th of December he recovered very well. He had major spinal surgery and after a couple of weeks at home you would never know what he had been through. He is coping well with his new limitations now that he has metal work fitted from the top of his rib cage to Lumbar Spine No. 3 and another rod from as far up his spine near his neck as they could go to the same vertebrae. Looking at the X-rays it is very hard to believe he is carrying it all around with him day to day. He is now back at school and is coping well. He is still taking part in PE although he is now unable to do forward rolls etc. He is thankfully still able to climb on apparatus and swing on the ropes. I am sure his teacher is going to collapse with fright one of these days! We went back to Birmingham last week and he is scheduled to have further surgery at the end of April. They are going to lengthen the VEPTR and titanium rod then. It will mean 2 incisions which we haven’t been used to before, but knowing Reuben he will bounce back pretty well. The only trouble is that as he gets older he worries more and he picks up on bits of conversations so it’s hard to distract him anymore. Reuben’s little Brother Louis turned 2 on Saturday! It is hard to imagine where the time goes. Post Pals has really helped Reuben on his road to recovery. He really enjoys seeing post on the doormat for him! Thanks to Julie, Kate, Karen, Michelle, Linda and all the wonderful people who take the time to volunteer. Reuben was scheduled to be in Birmingham today for his operation tomorrow. Unfortunately we had an answer phone message left for us telling us it has been cancelled as they needed the theatre space for an emergency. Reuben’s operation is now on the 12th of December. We are pretty gutted as it is so close to his Birthday and to Christmas and we have lost that week of recovery before them. We hadn’t told Reuben he was due to go in, so at the moment he is still none the wiser thank goodness. So for another week, we have to pray that he doesn’t come into contact with any germs which could threaten the operation. Easier said than done as the amount of coughs, colds and chicken pox flying around at the moment is huge! Reuben had a big early Birthday party on Sunday with 35 children there. It was pretty wild, but he had a great time although he was exhausted. So, hopefully this time next week we will be in Birmingham awaiting the dreaded operation. I am sure this will be the best chance I will get to wish everyone reading this and to everyone at Post Pals a very Happy Christmas and New Year. The work you do is so valuable and we thank you very much. Here’s hoping for a better 2008. Reuben had an appointment in Birmingham today. We have finally had a date for his operation. As long as it isn’t cancelled for the 4th time, it is due to take place on the 5th December. I know there is never a good time but it is so close to his birthday and Christmas, it is sure to spoil them for him. Reuben is having his VEPTR implant completely replaced and 2 new isola rods fitted to either side of his spine. He was due to have an anterior growth arrest done on some extra vertebrae which are growing, but that isn’t going to happen at the moment. We are pretty relieved as it is nasty and they apparently have to do it from the front of his chest. This with the other two operations concerned us. Thankfully, Mr Marks decided that it was too much to put him through for too little a result. Generally, Reuben is keeping very well. He seems to have grown lately. He is getting increasingly tired and he looks more twisted as he walks and especially when he runs, but the surgery should hopefully help that. He is going to miss about 6 weeks of school which is a pity, but of course it could be far worse. We do feel much happier after today’s meeting that the right decision has been made for our little boy. I am just willing Christmas to be here then the worst will be over. Thanks again for the post, he loves it! 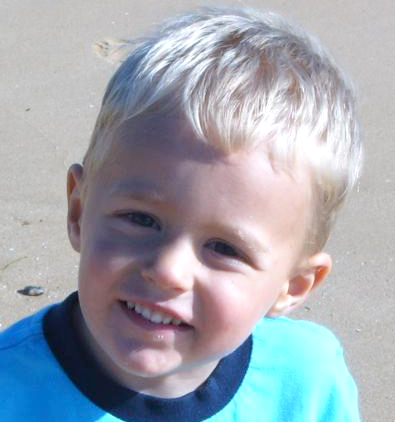 Reuben’s operation for the 11th July 2007 is now cancelled. The surgery had been booked on a day with another child and Reuben needs the day to himself as the operation is 7-8 hours long apparently. Anyway we are waiting now for a new date. It has all been a bit of a nightmare as arrangements had been made for Louis at home whilst we were away. Now it’s a struggle as friends, family and Louis’ child minder are due to go away in August so it could be tricky, but hey ho it could be worse. One of Louis’ little friends has been diagnosed with Ecoli, so at the moment we are in quarantine until Louis’ results come back clear (fingers crossed). Reuben is fine, he is tired at the moment, and I think school is taking its toll. At least the summer holidays will soon be here. Reuben had a great time when we were on holiday a fortnight ago. He did lots of swimming and learnt a little Spanish (very cute). Shame it hasn’t stopped raining since we got home!!! Today Reuben was meant to be in Birmingham Children’s hospital having his VEPTR implant lengthened but we are at home! We had a last minute phone call to say the operation was cancelled. The surgeon who was due to carry out the procedure wasn’t happy about doing the operation and so we were called in to the hospital on Monday to discuss what the plan was to be. To cut a very long story short, he was being considered to have a second VEPTR put in near to his spine so we thought we were going to discuss this operation and when they were going to do it. They have told us that this operation is now off as it was in their opinion too experimental and short term. Reuben is now unfortunately in line to have spinal rods fitted next month. We certainly were not expecting this, as we had previously been told that this was something he would need but they would hold off for as long as they could as it is risky and also the infection rate is high post op. Reuben is also having a growth arrest operation on a rogue piece of vertebrae which is extra and is growing, making his top curve worse. We managed to have a look at the CT scan and clearly saw the spine and to be honest from the ribs up it just looks like a blob of melted candle wax. It still beggars belief as he is still so fit and healthy looking and completely mobile. We don’t know what the future holds post op, so if anyone has any experiences of Isola rods please email us, as we are craving information and I can’t find anything on the internet. Thank you again for everything you do, it is much appreciated. Thank you so much to everyone who has written and sent parcels to Reuben. A very special thank you to Kate Dee for the Power Ranger, he was over the moon with it and I had to persuade him not to take it to bed!! We have been notified that Reuben is going into Birmingham next Wednesday (2nd May). We haven’t had any consultation about this or what the future surgery plan is for Reuben so we are none the wiser really. Next Wednesday they are going to lengthen the new part of the VEPTR which they fitted last September. I am hoping that they will be able to give us an idea of their plan for our little fella next week. We would just like to have an idea of what’s what, especially as Reuben is now in school. Reuben hasn’t however been in school for a few days as he has had tonsillitis so he is on antibiotics. Hopefully it won’t affect his operation date. We don’t want to prolong it too much. We also have a holiday booked in June which will be great for him and for his wound healing in the sunshine. Not sure how and when he will return to school after this operation as it is all new to us, but I guess we will have to see how it goes. I have always been one for planning but I am fast learning that where Reuben is concerned and Louis too, it is just not possible!! Thank you so much for the post. Reuben and Louis really enjoy it. Reuben loves the fuss, it just emphasizes that he and his ‘special’ back are special. Reuben had an appointment on March 19th in Birmingham. The object of the appointment was to see if Reuben’s spinal curve had worsened since his last operation. Reuben was really anxious about going despite us reassuring him that he was only going for an xray and chat. When we arrived at the orthopaedic hospital, he was just so relieved that it wasn’t the Children’s hospital where he has his surgery. He is really switched on to it all now and we have to be quite careful what we say in his presence! We saw other children at the hospital who obviously had severe spinal curves as they were unable to stand straight etc. We were struggling to accept the diagnosis of Reuben being very severe as he appears to be so ‘normal’? Anyway, once Reuben had his xray, we spoke to his specialist and he explained that Reuben has 2 curves like an ‘s’ shape. This means one curve balances out the other which is why he isn’t bent to one side. So having a double curve is causing them a headache as they don’t know what to do next. At the moment he has one VEPTR on his rib cage and they want to also fix in isola spinal rods but not until he is around 7yrs old due to infection risks and the other associated risks involved. So at the moment the specialist doesn’t know whether to put in another VEPTR on the opposite side from the top to the bottom of his spine until he has the isola rods, or leave him and see what happens. The surgeons have not had a case like Reuben before, and to be fair he couldn’t make a decision as to what they will do. So it has been left that we will receive a letter within 2 weeks to tell us what they have decided. So life is kind of on hold again and when the postman drops the mail through the door my heart is thumping! Reuben just had his first parents evening and he is doing very well at school. The sad thing is that the teacher told us of his talent for PE. He is really adventurous and enjoys it very much. Depending on whether he has this second VEPTR will depend as to whether he will be able to continue doing PE as it is at the moment. So we will have to see what happens! Reuben is great at the moment. We still have random days where he re-lives events in Birmingham Hospital even down to food he ate there 2 yrs ago (no I am not joking!!) We don’t go back now until March 19th which is nice as we have a busy time ahead of us starting tomorrow!! My little fella is starting school! I feel utterly devastated by the thought but I am sure it will be okay. We fought for so long for Reuben to have his first lot of pioneering surgery and ever since I seem to be battling on his behalf for one thing or another. It feels odd handing him over to a teacher who has 18 other little people to look after when he is used to pretty much 1:1. He is more than ready though and I think he will enjoy it. We have to make the best of it because if he has spinal surgery later this year he will miss a lot of school and his life will be more restricted. Thanks to all the wonderfully kind and thoughtful people who sent presents to Reuben and Louis too!! Christmas was truly wonderful and Reuben was overwhelmed with it all. Louis I have to say just enjoyed eating the wrapping paper on the day but has since discovered the joys of playing with his new toys and books!! There are too many people to thank one by one, but you know who you are so from the bottom of our hearts ‘THANK YOU’. Special thanks do have to go to Julie and Alan, Kate Dee, Steve and Kirsty (Pal). Reuben had his operation on the 20th of September. The operation went to plan but it was terribly difficult for Reuben who was left pretty traumatized by it all. He was in much more pain than usual and controlling this was a huge challenge. The Surgeons replaced the middle section of the VEPTR as the previous part could no longer be extended. This was the first time they had done this operation. We returned to see the Surgeons a couple of weeks ago and they were satisfied with the way surgery had gone and the VEPTR is supporting the rib cage and his lung is able to expand. However, when studying the x-rays they noticed that he is now leaning more to the right (spine) and this is a cause for concern. I think now that they are happy that the lung and ribs are okay they are going to need to put their thinking caps on as to how to sort out this next problem. They are looking to perform pretty major spinal surgery next year, when will depend on the next review in March. They have a couple of options but both are things the surgeons have never done before so we are pretty worried. The next surgery will also impact on activities he is able to carry out. It will be a huge blow for Reuben. He is getting more and more aware of what is going on and he gets very upset and anxious. All we can do at the moment is enjoy his 4th Birthday, Christmas and baby Louis’ 1st Birthday which all come and go before March 19th!!! Reuben currently is back to his lively happy self and apart from the odd nightmare about hospital life is pretty normal. He has started two 1 1/2 hr sessions a week at his Primary School which he adores so he is being a busy bee which is just as well as he is so ready for full time school. Thanks to everyone who sends Reuben post and a special thank you to Kate Dee for the fantastic balloons. Thank you to Julie and Alan Barrett and to Bob for the bear who Reuben now calls ‘little Reuben’. Reuben has his 4th operation on Wednesday the 20th of September at Birmingham Children’s Hospital. He is due to have part of his implant replaced and also lengthened. Reuben is yet to learn of his operation as we don’t intend to tell him until the night before. He isn’t coping too well at the moment with his ‘special’ back and is frequently re-living previous operations and hospital experiences, so the timing of this operation isn’t great, but hey when is it??? Apart from the above, Reuben is on good from and is a joy to be around. He is so full of energy and life and soooooo many questions, they are just never ending. I didn’t realize a 3 year old could have such a thirst for knowledge!!! Thank you to Julie and Alan Barrett for the post. Reuben is currently experiencing difficulty traveling in the car as he is finding it very uncomfortable. He has been seen by an OT who doesn’t really have any ideas as to how to help, which is a shame when we want to spend the day at the seaside!!! Reuben’s surgeon has been approached by our GP to see whether his next operation needs to be brought forward, and maybe this might help him in the car. Reuben is still just so crazy about his baby brother which is lovely and he still enjoys his post. He asked for a pinboard for his bedroom so he can look at his postcards etc. Reuben is really well at the moment apart from a heavy cold which just won’t shift. He still really enjoys the post he receives. We are still awaiting confirmation that his new baby brother Louis’s spine is okay, but at the moment he is a bit small to tell without x-rays etc so we will wait until he is a little bigger!! Reuben has started pre-school one morning a week and he loves it, it was hard letting him go without me but with full time school starting in January next year I have to let go sometime!!! Reuben had a very successful lengthening of his titanium rib at the beginning of February. We are not sure at the moment how much he was lengthened by. The next surgery will involve the fitting of a new middle section as the titanium rib has been lengthened as much as it can go. The surgeon was very confident about this and it appears that Reuben is doing very well on the treatment. This time even Reuben’s wound healed with no infection or complications so all in all it went very well. On the 8th of March Reuben’s baby brother was born. His name is Louis George and he weighed 7lb and 3oz. Reuben is very smitten at the moment. I hope it continues. This month Reuben was sent cards from the card making forum. The timing was just perfect as so many came after his operation, I think he felt even more special. All of the cards received were really wonderful, thank you to all the ladies who must have spent such a great deal of time making them. We will treasure them always. Thank you so much to Kate Dee for her beautiful gifts and the most fantastic balloon we have ever seen. Reuben has had his operation brought forward to Wednesday 1st February in Birmingham Children’s Hospital. He is having the titanium rib lengthened. It is a relief really that they are not fitting a second device on this occasion. We haven’t really discussed it with him as he got very stressed out when we talked about going for a check-up last Monday. I am sure he will be fine; he is a strong and gritty little fella. Thank you to all concerned for the wonderful post. Reuben has another operation on the 8th of February in Birmingham. We go for tests on the 23rd of this month and that will determine what he will be having done. We are hoping it is just a lengthening of the titanium implant. I will be 36 weeks pregnant with No 2 when he has his operation, so the least complicated the better really!! Reuben has been very well this month and his Birthday and Christmas presents were ‘out of this world’. Reuben had lots of farm toys, which have gone down a treat, especially as he will now play for short periods on his own using his wonderful imagination and Mummy and Daddy can have a little break! We would like to thank everyone who sent cards and gifts to Reuben. I would have liked to have written individually but there were so many I just can’t. We would however like to thank KATE DEE from the bottom of our hearts. Reuben is doing really well. His scar has healed nicely and he is back to being a normal and busy 2 year old. We have booked a family holiday and Reuben is so excited about going that i think he may burst! Thank you again for the lovely post Reuben has been receiving, it really makes his day. Reuben had his operation on the 13th July in Birmingham. The surgeons managed to lengthen his titanium rib by a few millimetres. Not terribly satisfying for the surgeon, but they cannot stretch Reuben too much or everything will just collapse and break. Hopefully he willl be left alone now until around January, unless anything breaks whilst he is playing wildly!!!!! Reuben had a nasty reaction to the gas this time and was very sick. Fortunately as with all the children you read about on this site, he bounced back and is now a very busy 2yr old once again. Reuben told us that he had a very ‘special’ back, we try not to keep secrets from him and prepare him as well as we think we can for trips to hospital. I would hate him to be shocked and unprepared for anything planned. Reuben loves his post, it really does make him so happy. Reuben just gets so excited if there is any post for him, we are overwhelmed by peoples kindness. Thanks to all, but special thanks to Katie Dee and Lesley Southerden. Reuben has his next operation now on the 13th July in the Birmingham Childrens Hospital. He will be admiited on the afternoon before and we are unsure at the moment how long he will be in for. He is having the titanium rib lengthened. Reuben’s surgery is now due to be 3rd August. Reuben is really chuffed with his letters and parcels (Mummy and Daddy get pretty excited too). Reuben has had a lot of emails this month. Reuben should have had an operation in May but didn’t. We will be phoning next week so I guess it will be now be June. Reuben has had chicken pox but he coped very well and is now back to his usual jolly and wicked self. Thank you for the yummy biscuits and the books from Israel! Also to Sue.